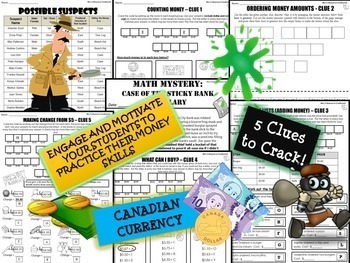 Students will need to solve a variety of money problems that will help catch the thief! 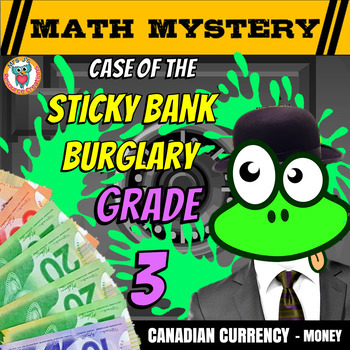 Engage and motivate your students with this unique and fun way to review their money math skills. NEW - Editable suspects list added to the packet. This way you can change the character names and alter the mystery outcome. There are also two alternative pre-made lists you can use instead. 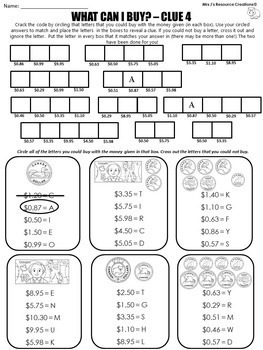 This is a great option if your students have already done this mystery story before and you need to change the mystery answer. - Clue 4: What can I buy? - A suspect declaration sheet that includes a clue completion checklist and a teacher check off as solved/try again. - Answer sheets for each clue plus a color coded guide to the elimination process of the suspect list. - Printable awards to give to students who solve the case. I hope your students enjoy. 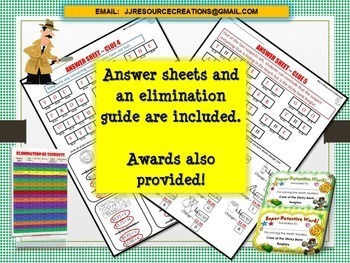 Please do not hesitate to email me on JJResourceCreations@gmail.com or use my store Q & A if you need help or have any questions when using this resource.